I am in the process of buying an apartment here in Melbourne, where the average price per square metre is 3,000 €. Needless to say, mine is very small. It is, however, virtually in the middle of the city, meaning I can finally dispense with my car, which has been gathering dust in a garage for almost a year now. Also, I'm embarrassed to say that I have never read 'La dame aux Camelias', or seen the George Cukor film. Fortunately, I can borrow the book from my university library and the film from the cinémathèque of which I am a member – and I will. As for screen adaptations of the late nineteenth and early twentieth century literature, my vote would to Max Ophuls: e.g. 'La Signora di tutti', 1934 (from a novel by Salvatore Gotta); 'Letter from an Unknown Woman', 1948 (from a story by Stefan Zweig); 'La Ronde, 1950 (based on a play by Arthur Schnitzler); 'Le Plaisir', 1952 (from short stories by Guy de Maupassant); and 'Madame de...', 1953 (from a novel by Louise de Vilmorin). In terms of comparable American literature and film, I have a soft spot for William Wyler's 'The Heiress', 1949 (based on Henry James' 'Washington Square') and Martin Scorsese's 'The Age of Innocence', 1993 (based on a novel by Edith Wharton). Half of the inhabitants of Paris live alone? Spending time in Paris alone I came to feel that I was considered downright perverse for being one of those bizarre creatures known as a "seul." I felt that the "City of Lights" was a city made for couples. Ah, but living alone and being alone can be two very different matters, at least up to a certain age... (yeah, my age). They say a good cure for loneliness is solitude. Rather a difficult condition to find in crowded Paris. Still, I wonder how life would be living in a small apartment in Paris... Any somewhat loner residents have comments about your Paris life? For a major city, that is not very expensive. At least it is a lot cheaper than NYC or many parts of California. I don't see how people buy in those places! Question: Do you think most people living there rent or buy? Now I understand why Louis was talking about literature and George Cukor...Eric mentioned it on the previous day's post! I was so confused where that was coming from! I have seen the movie, "Camille" with Greta Garbo. I liked it very much but then I like Garbo (even though she does tend to overact....not subtle for sure, especially in "Grand Hotel"...a great movie!). I have read a lot of 19th century literature from several countries but none from France! I don't know how that's happened. 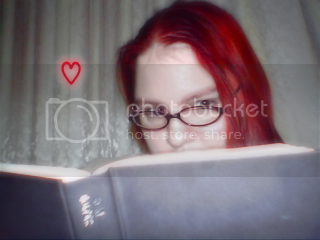 I most like Mark Twain, Dostoevsky, Tolstoy, Dickens and Faulkner. I suppose I should read some from France. Any recommendations? Love this photo. The little Santa is cute and adds great color. Susan (in Atlanta): There is so much to recommend! My suggestion is that you go to the relevant section of your local bookstore, pluck a handful of volumes from the shelf, and read the first few pages of each - until you come across something that you feel compelled to finish. On my list of things to do in life, I'm going to replace live in a Parisian flat with something else. Parisian flats are a far cry from a midwestern US house. The real estate prices are undeniable high in Paris, but you can still make your dreams come true;-). OT – can someone show me how to hyperlink in comments? 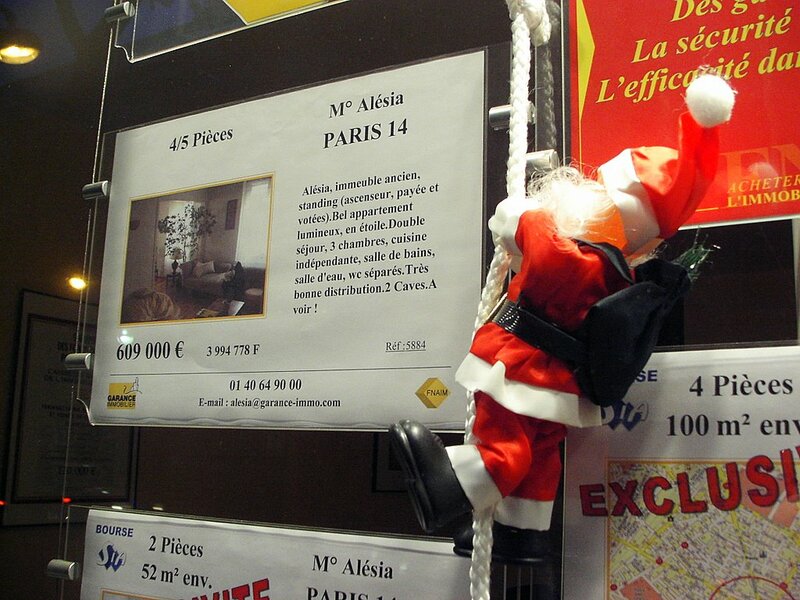 the santa join to sell the houses in Paris?? mmm....i really need a small room to live!!! how to make the big amount of money?? the price of the real estate in shanghai is also very expensive for us Chinese!!! but Paris.....its a dream, a dream,isabella. Thanks so much Louis...I will check it out! I know some of you keep saying that the prices are high but they are so reasonable! You couldn't get a nice 1BR in D.C. for anywhere close to that! Or NYC, or Chicago, Boston, Miami, L.A. (but really, who wants to live in L.A.? lol), San Diego, etc., etc.! I think you have a great thing going there in Paris! By the way, to live intown in a nice 1BR in Atlanta, it costs just about the same as Paris! And Atlanta has one of the best cost-of-living indices in the county for a large city. And Atlanta ain't Paris! Although it is nice...but still not Paris. You'll be linking before you know it! Let's try again, I'll put it in brackets so it won't make a link but don't use the outer brackets. Damn it. I don't know why it does that because I'm not inserting an actual URL. Geesh! A good place to check out prices of apartments is the craigslist.org site. There are listing for other cities as well. Many thanks hot(lanta) Susan (well, at least 3)! I think the hardest bit about finding a place in Paris is that there is no system to go to one agency or agent that you like and have them look all over Paris for you. You literally have to go from arrondissement to arrondissement to find the place. There are some special services that exist, but bascically they do the same thing, just do it for you. I still think investing in Paris real estate is almost a no-loss proposition (if you consider the long-term). There's only so much real estate here and as long as PDP is around, people will always be attracted to Paris! Hadn't visited PDP for a few days, love your last few photos, the ferris wheel, the red and green giants awaiting the tram, Party Time and the little green (blue?) shop... wonderful ! "Watch out for France 24 (if you haven't already seen its launch): the new global TV channel designed to "counter Anglo-Saxon cultural imperialism", a cause that even as an Englishman I fully endorse, as you know. France is the only country that can possibly attempt it. Alas, my informant says that France 24 has already been nicknamed Demander à Chirac!" Any feedback your end about that, Eric? Eric this is SO interesting, thanks for this. I will do the same soon on my blog, wouldn't it be fascinating to see prices around the world? For one of the pretty little Cotswold villages, UK., you can't really buy a 3 bed house for less than £375,000 and some are much higher. Isabella, you manage to link BY MISTAKE? I have no idea how to do it so please tell. Great to hear of your friend knocking the price down. I always attempt the same tactic. I must read La Dame too, now that Eric has recommended it. Eric, do you have any idea why half Parisians live alone? How much does tax advantage affect this decision? I can vouch that there are certain advantages of doing so (!) - make your own decisions, etc., do the ironing in nothing but your underwear and a face pack, but there is nothing quite like sharing your life with someone you love. So, I'm curious. For those who have been following the Suffolk Murders in the UK, it was just announced a man has been arrested. More at my blog (Things UK on my list). Not meaning to take people away from Eric of course, come back here after! I keep asking Noel for a big house but I don't know why he never fulfills my wishes. By the way Merry Christmas to you all. The business of selling houses hasn't control, if now it's this way, can you imagine in the future? It amazes me how quickly Paris takes your soul hostage and never lets go. I can't afford to live there, but thank goodness for PDP. Real Estate in all the big, attractive cities of the world is extremely expensive. I understand that there are many apartments in Paris that have been taken off of the market though and sit empty because the owners don't want to deal with the problem of tenants and tenants laws. My friends in Paris bought an older apartment on the border of the 11eme and the 3eme on the Blvd du Temple in April 2005, it needed a lot of work done, especially in the kitchen. They told me that area was getting 5,000euro per sq metre and the one they bought was 77sq metre...so things keep going up, up, up...just like San Francisco..which is ridiculous as far as buying and renting goes. In Paris though, my friends told me that their apartment was a bit cheaper just because it was on the 11eme side of the Blvd du Temple...the other side of the street with the 3eme postal code was plus cher....So...go figure! If I won the Super-Lotto in CA, the first thing I would do is buy an apt in Paris and never look back!! kp gallant: I've been telling people the same thing. If I win the lottery, I'll start looking in the 6th arr., then see what happens. I want to walk to the Cafe du Marie and look at Place St. Sulpice. Probably talking million$ of any currency. Meanwhile, I'll just have to drink cahors. The Spoon Bridge and Cherry is not a bad fountain, though, so I have some street art. jeff: I was thinking more of a little top floor flat in the 7eme with a view of the Tour Eiffel...LOL!! But I would be happy with the 12eme[where I saw studio apartments for sale for $60,000 in 2002..!! ]oh hell...anywhere would do...even Belleville..[which is actually quite interesting]...Keep those fingers crossed! Wait!! Wasn't that SANTA in that photo??? Maybe he's picking out my place right now!! Oh Eric...Did you see Santa with some keys for my apartment?? LOL!! No, no kpgallant, those keys in Santa's hand were for MY apartment. I know, let's buy a DP apartment between us all, divide up the year into weeks and SHARE it! Eric, is it true that people over the age of 60 still think of property prices in terms of ancien francs? Oh lordy I miss you guys sooo much! Sometimes I hate being so busy. Anyway, I live in a good place. St. Louis is one of the most affordable big cities in the country. Though I can't afford it right now I'm resting easy knowing that someday I can bujy a nice large 2 story house with lots of room for anywhere between $120,000USD and $250,000USD. Don't know when I'll be on here next, so I want to say that I miss you all and love you all and I hope you have happy holidays! And MERRY CHRISTMAS!!! of the French own their housing; I don't know about Paris in particular. > Susan (Atlanta). You MUST read some. Start with Maupassant. My favorite! > Louis. I never read it. Actually I have never read anything by Huysmans. I will. > Amour (A moor...). What is a far cry? > Jeff. Maybe you'll buy Catherine Deneuve's apartment on the Place Saint Sulpice! I see now the singles in Paris all have reasons, interesting; thanks. Yes it's good that they are questioning this man, but he has been arrested, you are right, on suspicion of the murders only. He has not yet been charged. Police have 72 hours in which to keep him, then must either charge or release him, pending an extension granted by a magistrate. The investigation is ongoing. How long did you own this apartment you mentioned? Lynn, there was a story in NYTimes about what you said. A share!! This woman wanted to buy a plantation (house plus olive farm) in Italy but she couldn't afford it. So she got some friends together and bought the property. Paris, to me, would be an ideal place to experience "the loneliness in a crowd," the worst kind. One thinks of Daumier. If a family can appear this isolated and unconnected pity the lone person. Well.. expensive or not I wish Santa Klaus would bring me a flat in Paris for Christmas.... Do you think he 'll have enough room in his sack for a 80-square meter Parisian flat??! No i'm afraid not, Patoche, because mine is already in there. What do you desire do you deficiency viagra or generic viagra or viagra online then what you may boon is it will. submit c be communicated but you pull someone's leg to put aside to [url=http://premedforum.stanford.edu/viewtopic.php?t=402]Buy Viagra[/url] to notice it. gone away from yep it works so strive viagra today and the awnser today query when then correctness on out.